Velayati in Moscow towards the axis Moscow-Tehran! Being in Moscow from 1 to 4 February of this year Advisor for International Affairs of the Supreme Leader of Iran, Ali Akbar Velayati, has caused a lot of questions in the Arab world, especially among the GCC countries and the West. In fact, after the lifting of sanctions with Iran actively speculation that the United States decided to turn Tehran into a main partner in the region, and thus send a clear signal to Saudi Arabia and Israel that their excessive obstinacy and independence from Washington's global policy will lead to the loss of the role of strategic allies in the Middle East. The second problem - a quarrel between Moscow and Tehran, and then, if possible, to incite Iran to Russia to open its way in the South Caucasus, the North Caucasus and Central Asia. And now, all wondering - what is behind this visit a person who is the de facto chief strategist Iranian foreign policy. Dr. Velayati on Monday, February 1, arrived on an official visit to Russia at the invitation of the head of the Russian Institute of Strategic Studies. During the official visit, meetings were held with senior officials of the country, including a meeting with Russian President Vladimir Putin took the conversation and exchange of views in the political sphere, the sphere of security, regional cooperation and strategic issues. Flight from Tehran to Moscow itself, Ali Akbar Velayati, in an interview with local media said that "relations between the Islamic Republic of Iran and Russia are unprecedented in the history of bilateral relations," and now are developing "in different spheres, including nuclear, defense and especially regional cooperation ", an example of which is the creation of a" coalition between Iran, Russia, Iraq and Syria. " It is more than clear that the more sophisticated the analysis of the statements of Iranian leaders will make emphasis on the last words, such as "regional cooperation." Here, as they say, and the "crux of the matter." That is the main thing for Russia and Iran now - to coordinate on Syria, Yemen, Iraq, Gulf security, the fight against IG / Give and against terrorism in general, in the price of oil policy in the world market, and most importantly - an agreement on cooperation to counter global US offensive in the Middle East, directed against Russia and Iran. It becomes clear, and the list of Russian officials with whom the province. This assistant of President Vladimir Putin, Yuri Ushakov, Security Council Secretary Nikolai Patrushev, Defense Minister Sergei Shoigu and Special Presidential Envoy on Syria, Alexander Lavrentyev. There were a number of meetings with the private nature of other VIPs of the Russian ruling establishment of which will be discussed in the next article. With the signing of the Joint Integrated Action Plan (CIMS) Tehran could get rid of the shackles of its foreign policy, and now it is necessary to expect new developments in the foreign policy process in the Middle East and beyond. After the agreement on the nuclear issue, and until the recent visit of Sergey Shoigu, Russian Defense Minister to Tehran, and now the current visit to Moscow, Ali Akbar Velayati, remained unclear future of relations with friendly countries of Iran sanctions period, including with Russia. The visit to Tehran Sergei Shoigu was remarkable in that it was the first trip in 15 years the Russian defense minister to Iran. Although it is still too early to conclude that the arrival of Shoigu's visit to Tehran and Velayati to Moscow indicate upcoming strategic shift in Russian-Iranian relations. Both countries have reason to believe that cooperation in the field of security and the economy can be mutually beneficial in terms of the policy pursued by the West against them. But not everyone in Tehran believe that in the hands of Moscow has the key to the solution of the Iranian problem, or that Russia really decided to look for new approaches in dealing with Tehran. In any case, in the regional and world politics Russia and Iran take a common position on many issues, and because of this they build a relationship based on mutual understanding in the framework of their existing goals. Moreover, the high-profile declaration is often taken more seriously in the field of international relations, than concrete actions. Against the background of growing convergence of views and the presence of the prerequisites for understanding of Russian-Iranian relations have other very strong base, such as geographical proximity and common strategic interests. These basic things can be crucial in bringing together Russia and Iran. We should not forget that the Islamic Republic of contradictions with the West and particularly the United States are not limited to only one issue and the Iranian nuclear program, ballistic missile development. Whatever it was, but at this point, Washington is still hostile to Iran, and what will be the attitude to Iran the new US administration, especially if the Republicans win, no one can predict. And Clinton, with its reliance on the Jewish lobby in the United States - is not a gift to Iran. What brings Moscow and Tehran? After the return of the Crimea to Russia in Tehran in March 2014 a close watch on the development of relations between Moscow and the West, and particularly the United States. Some militant and anti-Western figures in Tehran believe that the isolation of Russia the West gives Iran an opportunity to create a strategic alliance with President Vladimir Putin. They constantly go on about the end of American global dominance and a new world order in which the Islamic Republic of Iran in tandem with Russia can play a key role. However, no one in Tehran has not yet formulated a convincing concept towards that goal. If we carefully study the Iranian statement, it becomes clear : even the hardliners in Iran recognize that despite the loud statements of uniting the efforts of Iran and Russia in the sphere of economy and security, real-success in this direction, to put it mildly, quite a bit. However, those who feel a new era in Russian-Iranian relations, argue that this time in the calculation of the parties has undergone profound changes, giving a powerful impetus to these relations of force. 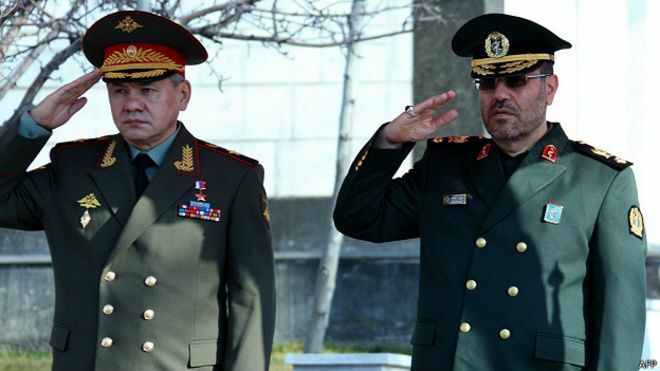 They point not only to visit Sergey Shoigu, which resulted in the signing of several agreements in the military sphere, but also to just ended visit Ali Akbar Velayati to Moscow. After all, Velayati is a legendary figure, one of the most prominent political figures of the Islamic Republic, a man, which from 1981 to 1997 he served as Minister of Foreign Affairs. But the importance of the trip Velayati to Moscow is more concerned with the fact that he is the principal adviser to Iran's Supreme Leader Ayatollah Ali Khamenei. The fact that the choice fell on Velayati, it suggests that the discussion of the Iranian policy towards Moscow is at the top, and that the tone he sets the spiritual leader of Iran. Iranian officials have long come to Moscow in accordance with the tasks they perform. For example, on the Iranian nuclear program in Moscow goes Foreign Minister George. Zarif. On the Syrian issue in talks with the Russian Federation is the Deputy Foreign Minister Hossein Amir Abdollahiyan, close to the Iranian General Kassem Sulejmani - the chief architect of Iran's policy in Syria. Settlement of the Caspian has been deputy head of the Iranian Foreign Ministry Ibrahim Rahimpur. In other words, Velayati visit to Moscow may indicate that some significant changes are brewing in the relationship. Mehr News Iranian news agency reported that in Moscow Velayati, Putin has achieved consent, to "raise the status of" Iran to the Shanghai Cooperation Organization, which is a Eurasian security bloc strengthens Russia and China in 1996 as a counterweight to Western international organizations. Due to the SCO observer countries, Iran since 2005 is trying to become a full member of this organization.Following this line, state Iranian media touted prospects for Iran's membership in the SCO. Fars News reached the point that the forecasted: Iran will get the green light for membership in September at the next annual summit of the alliance, which will be held in Tashkent. This seems to be true, because Chinese leader during his recent visit to Tehran, his (January 23) confirmed that Iran joining the SCO as a full member is no more obstacles. In addition to all the traditional areas of cooperation between Russia and Iran, the Syrian crisis is clearly a strategic issue for the continuation of cooperation between the two neighboring states. The Syrian issue is one of the major general the regional diplomacy between Moscow and Tehran, which, despite some minor differences, reflects that they have many similar interests. Tehran believes that the continued power of Bashar al-Assad - an indispensable condition for the territorial integrity of Syria. Moscow, in turn, supports any guarantees of respect for its interests in Syria. Whatever it was, the world and regional powers conduct their struggle with LIH, and the probability of winning this group in Iraq and Syria, it seems extremely doubtful, especially when you consider the depletion of its resources during the airstrikes videoconferencing RF on objects of oil infrastructure in the areas not yet under control IG / give. However, Russia's vulnerability to proigilovskim groups in Central Asia increases to Moscow's threat in the event of the surrender of a country in the Middle East region, where Russia is fighting the "Islamic state." Any victory IG militants able to jeopardize Moscow's interests in Central Asia. Here Iran, as a barrier to the promotion of the IG in the direction of the Russian Federation can play a very important role. It is important to once again return to the interview, which gave Velayati before flying to Moscow, Tehran, noting the mutual cooperation in the region, an example of which is the creation of a "coalition between Iran, Russia, Iraq and Syria." The latter at this stage - the key link. Not for nothing in Geneva February 3 evening antiasadovsakaya opposition broke off negotiations, convened under pressure from the US, which, despite the successes of the Syrian army and its allies in the Russian Federation, Iran and Hezbollah, have tried to impose a discussion on "Syria without Assad." Kerry, apparently delirious: in fact on the horizon of his departure, together with all the Obama team, just do not understand that Damascus, Moscow and Tehran is only one way - to further attack on all terrorists, whether the IG / Give, or prosaudovskie, prokatarskie or pro-Turkish groups. Offensive to complete victory, that is, the liberation of the entire territory of the CAP by the armed opposition. Without military cooperation between Russia and Iran have not achieved. Parts of Iran IRGC help "on the ground", and Russia bombed positions of the militants from the air, and in recent weeks it is done so well that the enemy retreats, and Syrian troops and people's militias of Kurds, Sunnis, Christians, Sunnis, etc. Free daily several settlements, moving in three strategic directions. Both countries are interested in preserving Iraq as a unified state. This is especially true now, when its disintegration actually started. And then there was 3 days nazadprezident of Iraqi Kurdistan Massoud Barzani called for a referendum on independence and the right of the Kurds to self-determination, the proviso, however, that this does not imply a declaration of statehood, and demonstrate the attitude of the Kurdish people for independence. Barzani assured that self-determination - this is what can not be denied, it is a "natural right granted by God." He noted that recently, many local politicians made false conclusions about the rights of the Kurdish people, and stressed that the Kurdish state in the Middle East - is real, and it can identify their rights. But, leaving all the forces of Syria, and Yemen, Tehran can not seriously fight even on the third "front", Iraq, especially without Russia. And lose, Iraq, Iran, too, is not too strategic importance it has for him. In the case of Iraq's disintegration, Iran gets on its border buffer states, which inevitably podomnut for themselves Sunni monarchies of Arabia and the United States.Russia also does not want the collapse of Iraq, because Barzani and Iraqi Kurdistan came under strong influence hostile to Turkey and the establishment on the territory of the Sunni Iraqi public education with the assistance of the United States and Saudi Arabia will create another enemy of Moscow.Especially since it is there that strengthened IG / give. Although the Saudis claim that the capital of the Republic of Yemen, Sana'a is about to fall, and the Shiite rebels Huthis lose their main stronghold, in fact, is not so simple. Arab coalition led by Riyadh blows to the ground entire Shiite areas in the cities and rural areas, but special promotion Yemeni troops their puppets in the face of the so-called President Abu Mansur Hadi not. The Saudis are trying to squeeze the Iranians from Yemen, have even gone on an airstrike on Iran's embassy in Sana'a. It is possible that such provocations will follow with regard to the diplomatic mission of Russia. But then Moscow will receive the right to strike "retaliation", blowing to pieces cruise missiles oil terminals Ras Tannury and Dammam, the way that will lead to a spike in world oil prices. And Tehran will give permission for their flight through its airspace. After all, it is beneficial for Iran, which after the release of the sanctions need large funds for reconstruction and modernization of the economy. And in this case, we have a community of interests of the two countries to coordinate action against the Saudi game under pressure from the US on the decline in oil prices. What other concrete results brought Velayati's visit, it is hard to say. This will become clear after the start of the practical steps for their implementation. But one thing is clear: Saudi Arabia and the conservative monarchies, like the US, have to think hard before you continue the line of the economic strangulation of Russia and Iran and inciting them liberal pro-Western "color revolutions". Otherwise, you may run into a powerful retaliatory strike, which will collapse the entire current architecture of Arabia, and Washington will have to just walk away from this region.